The play "Kanadehon Chûshingura" was originally written for the puppet theater (Bunraku) and staged for the first time in the 8th lunar month of 1748 in Ôsaka at the Takemotoza. It was adapted for Kabuki the same year and staged for the first time in the 12th lunar month of 1748 in Ôsaka at the Kado no Shibai [casting]. The fifth and sixth acts acts were performed with the actors Arashi Sanjûrô II and Yoshida Manshirô in the roles of Hayano Kanpei and Okaru. The "Teppô Watashi", "Futatsudama" and "Kanpei Harakiri" scenes, which are nowadays frequently performed (independently or as part of a tôshi kyôgen), are the fifth ("Teppô Watashi", "Futatsudama") and sixth ("Kanpei Harakiri") act of "Kanadehon Chûshingura". Hayano Kanpei was a retainer of En'ya Hangan, and he was at the Ashikaga mansion when the tragic incident leading to the downfall of his clan happened. However, he wasn't by the side of his master then, because he was meeting his lover Okaru, a lady-in-waiting to the En'ya Hangan household. Kanpei was very ashamed of it, and he and Okaru have run away. Now, Kanpei lives in Okaru's parents' home and has become a hunter in order to support his new family. He is waiting for a chance to apologize of his act. 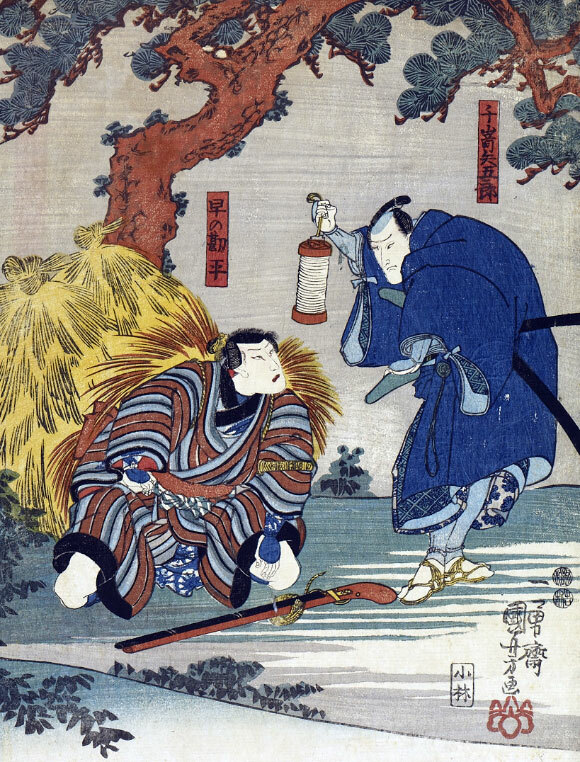 One rainy night, Kanpei asks a traveler to give fire to light the rope-fire of his musket. The traveler is Senzaki Yagorô, who was also one of the retainers of lord En'ya. Kanpei has heard some rumours about a vendetta and he would like to join the group to avenge the unfair death of their master. The cautious Yagorô says that there is a contribution fund in order to erect a commemorative monument to their late Lord. Kanpei might join if he could give them 50 ryô. Kanpei promises to find the money and they go their separate ways.